This year's Concorso Italiano, Monterey Car Week's Italian-only vehicle affair, was preceded by an announcement on behalf of Fiat and Bondurant Racing School. 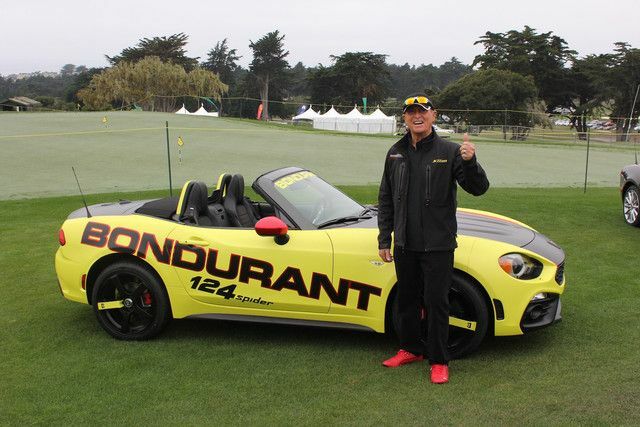 Bob Bondurant declared that buyers or lessors of Fiat's all-new 124 Abarth Spider would get a one-day class at the Bondurant School of High Performance Driving in Phoenix. In a move that aims to set the Abarth roadster apart from Mazda's MX-5 Miata Club, FCA has dug its heels into the enthusiast community. Though both the new MX-5 and Fiat 124 Spider share the same DNA, each vehicle maintains unique styling and driving character. Working in the Miata's favor is its curb weight (100 pounds less than the Fiat) and its styling (at least in this journalist's opinion). The Spider, by contrast, features a more premium interior, makes more power and torque, and has a more finely tuned electronic steering system.If these details alone can't help you decide, Fiat hopes the offer of a day of racing instruction by some of America's best coaches could sway you further. Bondurant went on to announce that it's autocross course would be expanded to accommodate the Fiat 124 Abarth. FCA has worked with Bondurant in the past, offering Dodge Viper buyers a free trip and driving instruction, but the same offer for a comparatively budget-priced ($28,100) vehicle purchase or lease has never been done. The day at Bondurant includes instructor-led skid, autocross, slalom, and team rally cross activities, plus hot laps. Having been coached by Bondurant's team personally, I can attest to their skill and effectiveness. Abarth Spider customers will be responsible for covering their own hotels, airfare, and other travel expenses, but the instruction alone is worth about $1,000. Don't plan to buy a Fiat 124 Abarth but still want some seat time at Bondurant? Fret not; you can still pay for the Abarth experience separately. « How many people plan to autocross their Fiat 124?